HiYa, well so much for mum staying home and hanging out with me all the time now that she retired. Nooooooo. She was off to play with racy cars and be silly at the Sci Fi Cat National. Mum says it is now a "Major" race. Picky. The event pin, kitty cruising around in its space ship looking for fun. Hmmm, a strange shadow? No, only mum with deely bobber antenna on her head. Smile Mum. Too much sun and squinting. Home now, we are cuddling and mum has her feets up to rest them. A bit achy from standing and walking around all day, over 3 miles! Plus they had chick-hen dinner when the day was done. Picture from last year on how they cook the birds. Mum said it was all tasty, no left overs for me! Well the really hots have gone, but still warm and humid. So we all are pacing ourselves to make sure we don't fall over in the heat! Well, Glimmer falls over whenever she wants. But that is just her! Some more of our plants. Mum has tried to put in things that are good for birds, bees and butterflies. We need more of them, plus they are fun to watch fly around. This is a globe thistle. We have two of these, one by the house, the other back in the garden by the fence. These plants were here when mum moved in. She thought the one by the house went away with the dungeon work a few years ago, but it has come back. One that mum put in is another bee balm plant. This one is furry tall and a different color too. Mum says it is also called wild bergamont or its official Latin name Monarda. Fancy! That is all for this week. Stop by again soon. I like having mum home all the time. I get so much more of this. Mum is trying to be good, not become a couch potato, so she tries to get out and walk a bunch every day, work in the yard a bit. Although with the hots being here, she isn't over doing it. Then she comes inside and I get my loves. Happy Monday, mum's first Monday without day hunting! She is doing OK adjusting so far, well, this, so far, isn't much more than a few days of vacation. We have to maybe wait a few weeks to see how she is doing then. Miss Megan, I let mum do her thing. You know you beans have to eat too and you eat strange stuff. I let her be happy in the kitch-hen, specially when there are times I do get good stuff. Like freshly grill roast beast. Continues to be the hots and muggy stuff. Mum did walk very early yesterday and a short walk too. Was out by 7:30 AM and back by 8:00 AM. A shower to cool down, fresh clothes, then readed the newsy paper and did laundry. I do get my share of loves. I camp out on her lap while she reads. I even help her hold the page down! Way too much excitement on our little dead end street last night. All sort of cars and trucks with flashy and blinking lights. Mum thinks they took someone from the house two doors down to the human stabby place. Heart or heat? Who knows for now. Hope they will be OK.
HiYa, Ducky here. We got the big time muggies! Mum was going to go for a quick walk, but wanted to get a little bit of foods in her tummy. She looked at the therm-o-meter, it was already 87! Hum-did-ity is so high some of our windows are fogged up! Mum decided to not go out in the heat. Me, what am I doing. Well keeping an eye on mum, and getting just a bit of filtered sun puddles. They is hot if you get the full sun. So mum, once she finishes her brekkie is going to make refridgidimater pickles. I don't think I will like them, but mum says she will. Stay cool everyone. Happy weekend. The big time hots are here. Mum was out watering flower pots so the flowers stay nice. Things were so good with enuf rain, but the past few weeks, little bits of rain. OK, Glimmer is just one of those cats who prefers to lie down. Oh well, she has such skinny legs, they must get tired. Mum's new plant for the year, the astilbe, has blossomed. Mum says it is kinda short, but then to bloom in its first year here, that is good. Yes, mum did wear her shirt to work. Here she was all dressed and ready to go. Mum thought it was fun to wear something different her last day. She said she spent most of the day in meetings, lunching and such. Came home early too! So not much to do on her last day. Her co-worker gave her an orchid, she had several cards that were signed by all sorts of people she worked with. One had plastic money in it! Cake and pizza as they brought in lunch for the gang. Mum checked before she left, wasn't much left and she didn't bring any home. Said the icing was super sweet! For mum to say that it must be as she does have a sweet tooth. A couple of balloons, she was thankful they didn't over decorate her cube, then she didn't have to clean it up. She took the picture of the balloons after she got home. So now it is time for her to get extra sleeps in the AM, so that mancat better not be waking her up too early. At least the noisy box by the bed won't be going off to wake her up to her tunes! Mum's Last Day Hunt Day! Well, I did get her out of the sleepy spot today. One last time to send her off to day hunt. But she had a wild choice for what to wear. Thanks Katnip Lounge humans and cats. Wow, that should keep her and the rest of the crew awake today. Mum has no idea of what will happen today, there is a department meeting, so if anything happens it will be then. Mum says this is going to be an exciting week. Hmmm, I wonder what is up. Oh yeah, the last days of day hunting. Mum is counting them down, days, hours, minutes. She even has something special to wear that day! We had a quiet weekend. Mum did her usual chores, readed books and even took a nap. I held her down for a bit so she rested. She did grill and make roast beast, she shared. Nice and tasty, medium rare. Yummy. Mum talked with Uncle Stormy tonight about going to visit. So if you go, does that mean party time for me? We shall see. HiYa, Ducky here. Happy Caturday. Me and mum are well rested. She got enuf sleeps last night which makes her happy. Plus she finished her last, full day hunting week! Woohoo, only three more hunts to go next week. 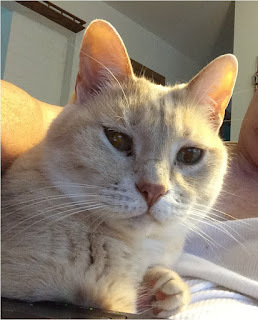 Here I am this morning getting loves from mum while she is still in her sleepy spot, we just love to connect first thing in the AM this way. Now on to the puter me watching mum look at a few things and put together this post. Mum says we will have our typical weekend with the usual chores. Nothing fancy, get foods, clean the clothes and house a bit. Nap, play, repeat! A nice pic of the three of us. Plus we two gingers needed to show off our stripes too! Not sure what kind of kitty Glimmer is! Flowers, we have lots and lots of flowers. First we have a bunch of our day lilies that we have. Most of them are blooming right now with lots of flower buds to come. Mum is thinking of going to the sale next month to get some more and different ones. Then the white cone flower and pink bee balm. Mum wants to get more of these too next year. All of these flowers are nice and hardy, stand up well to heat and not a lot of rain either. That is all for this week, enjoy the flowers. Love Virginger, Glimmer and Trooper. Nope, you know when we are mad, happy, tired. Watch our whiskers, ears and tails for clues! Mum read an interesting fact on her cat calendar a few weeks ago. "Orange cats are always striped and never solid; the gene for their orange-ness lies on the same place in the chromosome as the gene for striped fur. Therefore all red, orange or yellow cats are inevitably tabbies or striped." OK, Derby just had subtle strips on his legs and tail. Me you can see some faint body stripes too. We both had the "M" on on faces. Me, my very subtle stripes. This guy, is the kittie, Puddin, who lived where Grampie lived at the nursing home. You can see his stripes too! Isn't this a cool thing? So my orinch buddies, show me your stripes! Now it looks as though they're here to stay Oh, I believe in Caturday. HiYa, Ducky here. Just a quick song. Sir Paul was in town last night singing. Mum was not there to see him. Mum says that it's nice the old boy rocker stills got it. Quiet weekend for us around here. Mum needs to do her usual chores and such. Plus the hots and humids are gone, so lots of open windows. Me and mum had lots of good playtimes last night and today. Last night she had turned off all the lights and crawled into the sleepy spot. I brought mousie up so she could toss it. So she did for a few times. Then one time she tossed it, she tossed it high. I leaped up and smacked it right back at her! She laffed and said good job! Better let mum stop typing and get her chores done! Happy Weekend! OK, gotta get one thing straight, even mum didn't catch it. Yesterday the Duck reported "She is counting down days. Fingers, toes and nose of days left to work" Well we girls worked that out, that is wrong. That would be 21 days. Mum only has 10 actual workdays and 14 calendar days left. By this time in two weeks, she will be FREE! OK, now off to the garden. The day after we posted last week our first day lily opened. Purrty as usual. Then one of our cone flowers out in the front, they are getting ready to bloom. The ones in the back is not yet ready to flower. The trees grew, so they get less sun, so a bit slower. The the day lilies by the front walk. These were free when mum got the rest of them. She thought they would be yellow, but are looking a bit peachy. They should open in a few days, then we can tell for sure. Mum is thinking of going over for the sale again this year, sometime next month in MadTown! We survived they holly-day weekend. Not too noisy around here with firecrackers and such. Mum keeps the windows closed and they usually don't fire off much after our bedtime. I forgots to give a big THANK YOU to Auntie Trish of Catnip Lounge. Besides the Catio Chips I got this nice little blankie! Just the right size for the tower level. The hots are back, mum and I are taking it easy. She is counting down days. Fingers, toes and nose of days left to work. Happy Purrthday to our country, the United States of Mericky! Mum has more fingers to figure it out, says the country is 240 years old. That is a whole lot of years! Happy Independence Day to our fellow American Kitties. Hope all have a great day and cellybrate responsibly and have been cellybrating safely. 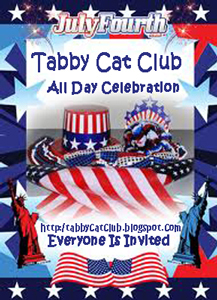 Come join the party over at The Tabby Cat Club. Everyone is welcome, member or not. A safe place for us kitties to hang with our furiends. Mum ordered these special in that they don't make booms to scare kitties. They are pretty but won't scare you. Mum skips the local fireworks, says the people just get crazy. Couple of years ago there were fights, a few years ago someone lost control of their metal monster and hit people standing by the side of the road. At which point they shut down the road. Now to honor America, please join in and sing a few songs with us. Sing them from your heart.